The Napa Vintner Stackable Wine Rack offers a wide variety of racking options, along with the ability to mix and match racking heights and styles. This wine rack collection was designed to accommodate wine bottles that are 3 - 3 1/2" in diameter. The Napa Vintner Stackable 1 Column Open Diamond Cube Wine Rack has open sides and cross intersection inserts that allow for this wine rack kit to be a more affordable bin wine storage option than the Solid Diamond Cube or Solid Diamond Bin, but achieving the same wine storage look. Purchase two to stack on top of each other to maximize the height of your wine storage. Assembly required. 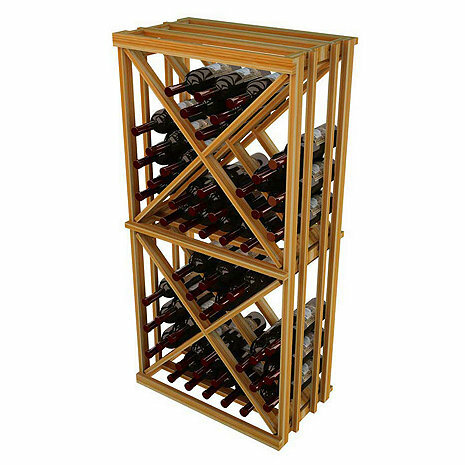 The Vintner Series 1 Column Open Diamond Cube Wine Rack can store up to 92 standard sized wine bottles. The open sides and cross intersection inserts allow for this wine rack kit to be a more affordable option than the Solid Diamond Cube or Solid Diamond Bin, but achieving the same wine storage look. Purchase two to stack on top of each other to maximize the height of your wine storage. Moldings and platforms sold separately. Wanted to hold 8 cases (96 bottles was indicated in description). Even using small bottles and jamming them in, I could only get 68-70 bottles in. So not even close. Since the sides are not solid wood, only wood strips, the bottle is not fully supported. When bottles are put on top, they have a tendency to slip off, since the lower row can easily wiggle. First time I came across such a poor product from Wine Enthusiast. Assembly directions were terrible, pieces were not labeled properly. Very flimsy wood. I still tried to put it together & wood was basically splitting in half. Stopped at that point & called to get return information. Was told they wouldn't take it back for credit if assembly was started. Probably the last item I will buy from Wine Enthusiat.